LANDOVER, Md. (AP) Missing several injured starters and adding to that list as the game wore on, the Washington Redskins were somehow a short-yardage field goal away from a nine-point lead against the Dallas Cowboys in the first half. So much for that. On a day that Washington kept finding ways to hurt itself, including fumbles on back-to-back touches of the football, this did not go as planned. A poor snap during a heavy rainstorm contributed to a blocked kick that Orlando Scandrick returned 86 yards , setting up Dallas at Washington’s 2. Two plays later, Ezekiel Elliott scored one of his two TDs, and instead of a growing deficit, the Cowboys suddenly held a lead they would not relinquish in what became a 33-19 victory over the Redskins on Sunday. The number of injuries for Washington (3-4) was startling, even by NFL standards. The team began the game without three starting offensive linemen, a starting cornerback and a starting linebacker who just went on injured reserve. By game’s end, a fourth starting o-lineman (left guard Shawn Lauvao, stinger) was gone, too, as was the backup to the backup left tackle (T.J. Clemmings, left ankle). There was more. Two tight ends left in the first half, Jordan Reed (right hamstring) and Niles Paul (concussion). Two safeties left in the second half, Stefan McClure (hamstring) and Montae Nicholson (shoulder). Defensive lineman Matt Ioannidis broke his hand. It also adjusted his play-calling options, as did the absences at tight end. That’s no excuse for poor play, however, and Washington made plenty of mistakes. The big swing for Dallas came on the 36-yard field-goal try with about 3 minutes left in the second quarter. Washington led 13-7, with a chance to make it 16-7. A low snap didn’t help, and rookie Nick Rose’s kick was slapped by Tyrone Crawford. Scandrick grabbed the ball, changed directions and headed up the sideline. 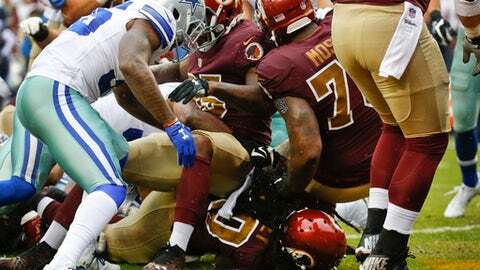 He was dragged down at the 4 by right tackle Morgan Moses, of all people – a guy playing on two bum ankles. A penalty on the Redskins put the ball at the 2, and moments later, Dallas was up 14-13. ”An unfortunate chain of events,” Williams called it. There were other issues for Washington. Kirk Cousins (26 of 39, 263 yards, one touchdown, one interception) fumbled the ball on a strip-sack, leading to a field goal for the Cowboys. On the ensuing kickoff, Chris Thompson fumbled, leading to yet another field goal. Washington actually was within a touchdown after a late TD toss from Cousins to Josh Doctson. The Redskins got the ball back with about a minute left, but Cousins threw a pick-6. Things won’t get easier for Washington, which is now third in the NFC East, behind Philadelphia (7-1) and Dallas (4-3). The Redskins are also 0-3 in division play. Plus, there are all those injuries. Now come games against three teams (at Seattle, hosting Minnesota, at New Orleans) with a combined record of 16-6.